The violence perpetrated by men against women must stop and it is up to men to stop it. The victims are not merely statistics; they are wives, sisters, mothers, daughters and friends. Good men cannot and will not sit on the sidelines while those they love are at risk of harm. White Ribbon Australia believes in the capacity of the individual to change and to encourage change in others. Our generation can and must work towards stopping violence against women so that all women can live in safety, free from violence and abuse. The prevention of violence against women will change society for the better. For several years Quantum Martial Arts, and the NSJJ network, has supported White Ribbon by running Women’s Self Defence workshops. Our past Self Defence Workshops have been female led by senior Black Belt Instructors May-Lai Paulin and Mel Barrett, with assistance from Ben and Darren, Quantum Co-Founders. 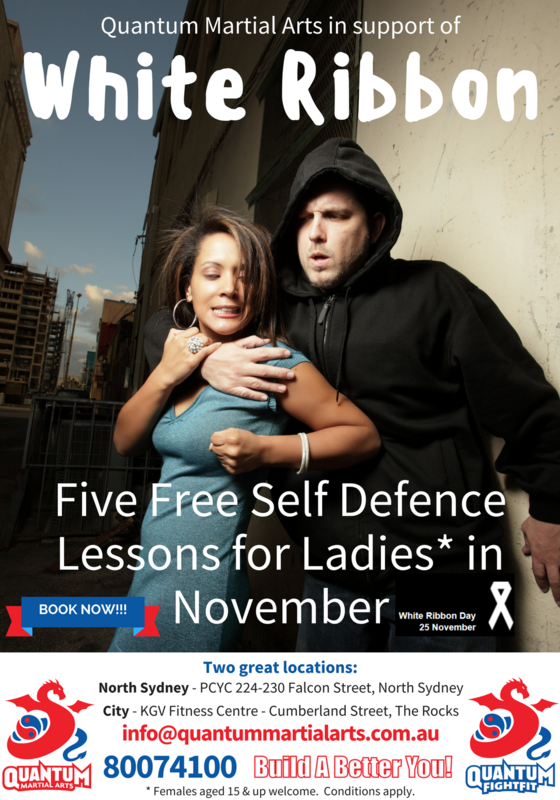 In 2016 Quantum is supporting White Ribbon by offering ladies (15 and over) 5 free self defence lessons at Quantum classes in November. If you would like an A3 version of the Poster above to put up at your work please contact the Office as well.